1) it took 3 days to learn to say fluently al-bu-quer-que, and believe me it wasn't easy! So, New Mexico, here I come. GTG anyone? I will be there from Sunday January 13 through Friday January 18. Who's in the area, maybe a GTG? Southwest announced a sale, which I've missed one-way, still saved $80 on the RT. Made Elderhostel reservation for a program, their hotel has a free shuttle... I am almost prepared! Now need to figure out how to fill in free time, if any. Faina: several Indian casinos around ALQ. Depending on your time, make a sidetrip to Santa Fe. Easy, you know I don't gamble and don't drive, but thank you anyway. Oh, well then see if Elderhostel will move the program to Santa Fe! ;-) If they won't, Old Town Albuquerque is pretty neat in its own right. We'll have one full day field trip to Santa Fe. No Taos. Sounds good to me! count me in on a GTG. Thursday the 17th would work for me! Count me in for a GTG! Cool! Thursday the 17th it is! the bus fare is $1. Is it for one bus? What if I need 2 buses to get where I'm going? Do I get a transfer (ticket) from the driver? what about going back? if I go back 1/2 hour after I got there, can I use the same transfer? In SF, the time is marked on the transfer and I can use it in any direction. can somebody explain how the bus payments work in Albuquerque? If you don't have a cell phone with free long distance - I will call the Transit place next week for you and find out what I can. Oh gawd, you're killin' me, Beachgirl. But thanks for leaving a full jar for me. I wonder, will they ship that stuff now? Didn't have it on their website last time I checked..... YES! Sending off an order for 6 jars tomorrow! 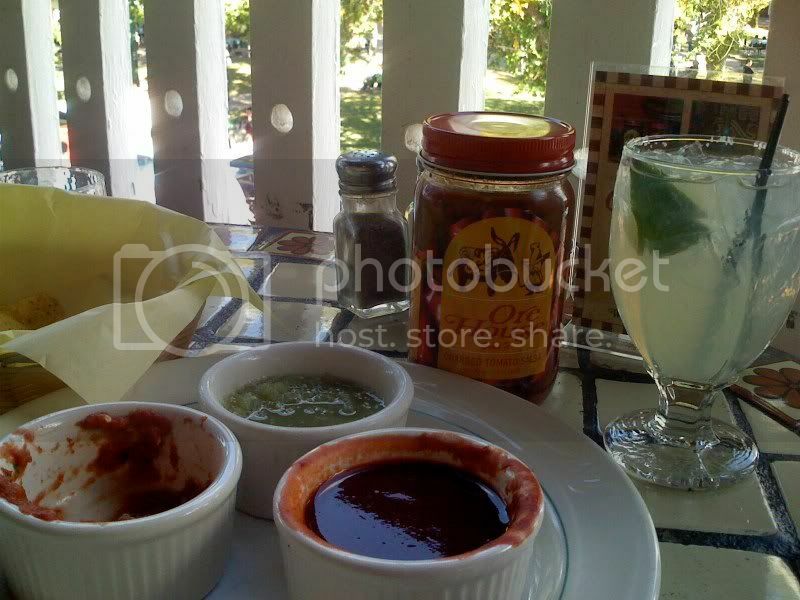 beachbum, when we were there Ore House actually ran OUT of the charred tomato salsa!! I had to buy a jar to get my "fix". Working on staying over for the GTG -- hope it works out. Charred salsa? Is this what they will feed me there? Why go then? I can char anything at home! Debi, thank you, I saw the website. I guess I'll ask the driver. Not sure yet if I'll have time for travels on my own, usually EH keep you busy. I have a picture of Kimo on my desktop with 4 pick-up trucks parked by it. Is the GTG still planned for Thursday the 17th? Where will it be in ABQ? Girl, we haven't gotten that far as to "where" or "what time"
I will be tired after a day-long trip to Santa Fe... no car... can we meet at the Sandia Lounge in the hotel MCM Elegante?